Shōgatsu (正月, New Year) is the time when most Japanese carry out certain religious rituals, though many of them may not realize what they do has religious significance. The ancient Japanese believed that toshigami-sama (年神様, year god) visited them in the shōgatsu period and pretty much every ritual they did in shōgatsu, such as nenmatsu no ōsōji (年末の大掃除, yearend cleanup) and making osechi ryōri (お節料理, a special variety of foods eaten during the New Year period), was about welcoming toshigami to their houses to bring them happiness. The cleanup and making osechi food prior to Dec. 31 also have a practical reason that housewives do not want to work during sanganichi (三が日, Jan. 1 to 3) when every family member is at home on holiday. From midnight of Dec. 31, people line up at their local shrines for hatsu-mōde (初詣, the first visit to shrine of a year) to throw osaisen (お賽銭, monetary offerings) into saisen-bako (賽銭箱, offertory box) and pray to ujigami-sama (氏神様, local deity) for health, success and happiness for the year. Hatsu-mō de is usually done during sanganichi, but some do it on Jan. 4 or after to avoid crowds. Before the train system was developed, people simply visited their ujigamisama, but nowadays many of them go to large famous shrines and temples. The most famous is Meiji-Jingū (明治神宮, Meiji Jingu Shrine,) which attracts millions of visitors every year. 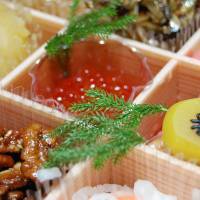 At home, family members get together to eat osechi ryōri (often shortened to osechi), on New Year’s day and the following days. 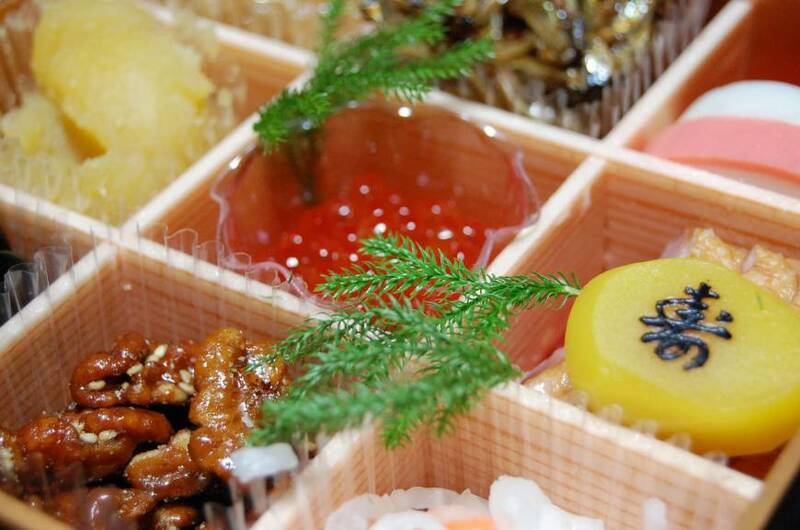 Foods in osechi are cooked in such a way that they can last many days, and many of the foods in osechi have meanings. For example, kuromame (黒豆, black beans) means you will mameni-hataraku (マメに働く, work hard). Yes, being able to work hard is a good thing in Japan. It also connotes being healthy enough to work hard. People eat kazunoko (数の子, herring roe) to be blessed with many children, and kurikinton (栗きんとん, sweet chestnuts stewed with sugar) are a bright yellow gold, connoting wealth. Buri (ブリ, adult yellowtail fish) is considered lucky for promotion at work because it is a shusse uo (出世魚, lit: fish that gets a promotion, but actually meaning fish that are called different names as they grow). While tai (鯛, red seabream) is lucky because it rhymes with medetai (めでたい, congratulatory). Tai is also eaten in other “medetai” occasions such as weddings. Tai is also called sakana no ōsama (魚の王様, king of fish) and a Japanese saying goes kusattemo tai (腐っても鯛, It is a red seabream even if it is rotten, meaning something that is not what it once was but still has class). Kobumaki (昆布巻き, rolled kelp with fish in it) rhymes with yorokobu (喜ぶ, be happy). Renkon (レンコン, lotus root) will enable you to look through the future because it has holes in it. Ebi (海老, shrimp) signify old people because they have hige (ひげ, mustache) and koshi ga magatteiru (腰が曲がっている, are hunchbacked), so eating them is believed to impart a long life. Ise ebi (伊勢海老, Japanese spiny lobster) may give you a luxurious beginning to the year, but kuruma ebi (クルマエビ, tiger shrimp) are suffice for regular households. Putting kagami mochi (鏡餅, mirror-shaped mochi, a stack of two pieces of round rice cake used as a New Year decoration) in various places of the house is also meant to welcome toshigami. It is so named as it looks like a round copper kagami (鏡, mirror) that was used in ancient Japan. The round shape is said to represent the heart and kagami mochi is said to offer accommodation to toshigami when it visits a house. They can be placed anywhere you want toshigami to come, such as the living room, inside a car and even in the toilet. Kagami mochi are often topped with daidai (ダイダイ, Japanese bitter orange), which is lucky because the word 代々 (many generations), sounds the same and connotes something will last many generations. The phrase senzo daidai tsutawaru (先祖代々伝わる, passed on for many generations) is used in describing rare treasures or highly respected craftsmanship. Otoshidama (お年玉, money usually given to children at New Year) is a ritual derived from kagami mochi. Parents and adult relatives give children otoshidama, usually several thousand yen. The origin of otoshidama is a Shinto event in which kannushi (神主, Shinto priests) give kagami mochi to shrine visitors. If you are a foreigner and are lucky enough to be invited to a Japanese person’s house over the New Year you’ll certainly impress your hosts if you know these various osechi meanings.